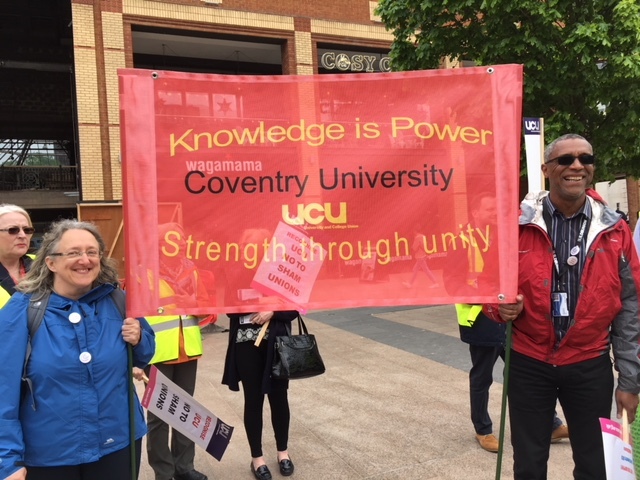 Coventry UCU have been at the cutting edge of defeating the union busting tactics of local university management. 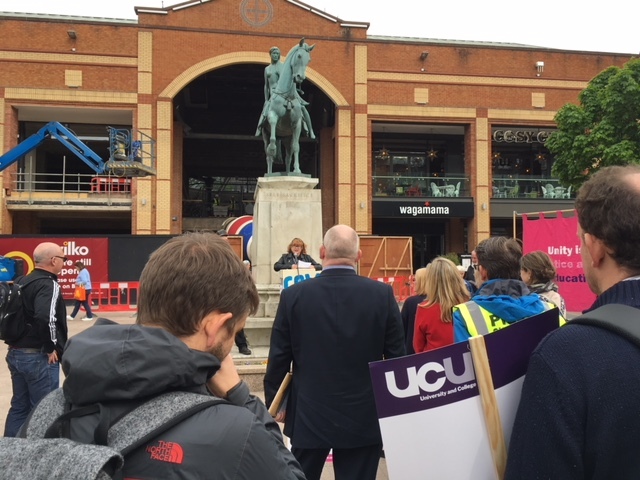 This week, saw a second, significant demonstration demanding that the Coventry University scrap their ‘sweetheart union’ imposed on the university’s subsidiary organisation ‘CU Group’ – a company wholly owned by the university, but where staff are paid less, have no proper pension scheme, and inadequate time to prepare courses – not to mention to to give pastoral support to students. Speakers from Coventry TUC who have also been outstanding in their support spoke again, demanding that the Board of Governors, who were meeting that day – tell management they need to sit down and talk to the UCU, on the basis of granting the full recognition that the staff have repeated shown they have demanded. The branch have consistently worked closely with the local community, the media, the wider labour movement and UCU regional and UK officials to build up the type of unstoppable campaign that will undoubtedly ensure victory in this campaign. They’ve also been heartened by the widespread support from UCU branches throughout the UK. It’s a template that other branches can learn from. The blog and our article had several thousand hits in the 24 hours following its publication, and since it was published we have received a number of critiques. This is a pleasing sign of a vibrant and democratic union. We unfortunately do not have the time to respond to many of these, but dialogue is important so we felt it important to give at least some kind of response. Several of the critiques have been about typos, run-on sentences, moments of non-clarity and the like. We are aware of these, and apologize for them, but this is something we put together in non-existent spare time to a tight deadline, so one will have to live with them. Other critiques were more substantive. For the sake of response we’ve chosen the most detailed one we are aware of to engage with. Take a bow Sam Dolan of Sheffield (who has graciously agreed to let us reply back here, and who we have invited to post a response of his own in the next few days). REPLY: Nothing in negotiations is ever certain till the ink dries, but our understanding is that DC is not currently being discussed as a live viable option. Maybe tomorrow the economy crashes, interest rates spike, the government slashes university spending, and abolishes tuition, and we are back in a DC world. Maybe if we reject the offer the UUK hawks take over, declare that we aren’t interested in negotiating and roll backwards on us (or maybe not – anybody pretending to know exactly what would happen for sure, is appealing to facts not in evidence). But we are content that this is a reasonably accurate description of where the negotiations are at right now. REPLY: People seem to think nothing is allowed to happen before April 2019 but that’s not strictly true, the USS Board can make changes whenever it likes. Realistically these changes get made by the tax year for obvious reasons. Still, it was nice to have this deadline codified. For what it’s worth, our understanding of the current deal is “No Change until April 2019 and then only change justified by a valuation methodology sanctioned by the expert panel, establishing the size of the cake, and JNC, how to divide it up.” Now it’s true that’s not written in stone, but at this point the pressures are generally more political than they are legal. If UUK suddenly announced draconian cuts in April 2019 while the independent report was still pending, they would have to know that this would spark a wave of anger, and this would lead to more strikes of the exact kind they are now making all these offers to try to defuse. DOLAN: Point 3. O&G write “That independent panel of experts would review USS’s valuation methodology in time to conduct a new valuation before April 2019“. But there is essentially nothing about timescale in the UUK text, or in Sally Hunt’s email, AFAICS (corrections welcome). REPLY: Again, it will be up to UCU to make sure the panel completes it’s work by then, and if not to make sure UUK don’t try anything too silly in the interim. It’s also worth noting that it’s not particularly clear what rule you could negotiate now to steer around this. For instance, let’s assume that the employers guaranteed not to change the pension plan until the independent committee completed its work. That would create an incentive for UCU to drag its feet and make sure the review took forever, so that we could keep the current deal alive for as long as possible. As much as we don’t trust UUK, they probably don’t trust us all that much either, and so are unlikely to agree to something which could create that dynamic. Now maybe you could come up with something more elaborate to side step around all of these issues, but that would take time, and would probably STILL be open to future abuse by someone clever enough. So regardless of how many months of intricate negotiations you conducted now to get a perfectly clear wording, its implementation would still likely depend on the balance of power between our ability to strike, and their build-in powers as employers. DOLAN: From 1/85th to 1/57th? It is essentially impossible that the USS scheme will be “broadly comparable to” the TPS, unless there is some radical Deus Ex Machina from Government. REPLY: The TPS’s apparently fantastic accrual rate of 1/57 is not directly comparable to our rate of 1/85 because unlike the TPS, our plan grants us an additional lump sum payment when we retire that is 3 times the value of our annual pension. Calculating whether you are better with a slower accrual + a lump sum on retirement vs. a faster accrual with no lump sum is an exercise that we leave to the actuaries (though we suspect it depends heavily on interest rates and how long you live after retirement). But let us stipulate, for the moment, that overall the TPS plan is the better one. How is it a bad thing that a committee examining our pensions would use this as a comparison point? Even if it could never quite be reached, that would put upwards pressure on the value of our pensions instead of downwards pressure. This is why the union has been insisting for years that TPS should be considered as a comparison, and UUK has argued that it should not be. The concession that it should be is a good thing for us! DOLAN: Point 5. “UUK and UCU would also agree to explore alternative ways of sharing risk.” But risk-sharing wasn’t mentioned at all in the UUK offer text? So point 5 looks like a backward step. REPLY: When they talk about exploring other models, such as Collective DC, what they are talking about is ways of sharing risk (recall, CDC removes risk from institutions, but shares it among many members).. REPLY: Uncertainty is a feature either way. If we reject the proposal, then we hope that the employers interpret this as an invitation to make clarifications and improvements and send it back. And they might! Or the hawks among them might seize the argument that we are not able to come to agreements with them, and that if they can tough out strikes through the examination period, then our leverage drops off a cliff over the summer, as there is no use picketing empty buildings. That is possible too. We don’t pretend to be able to handicap the odds either way. But if we accept the deal then, yes, we face uncertainty this way too. Partly that’s because this is an offer of PROCESS, not of OUTCOME. It makes no hard promises about future payments of any kind, past April 2019. Instead it focusses on addressing our core grievance that decisions were being made in an opaque way, based on opaque analyses, using opaque criteria, chosen for opaque reasons. A big part of our initial complaint that this was a process ripe for abuse, and, further, that we didn’t trust their numbers. What this offer does is offer a process that allows sunlight and input into deciding what the rules and criteria should be, and how they are decided. And it offers that this will be done sharing our goals of a pension that is comparable to the one that we and the teachers have now. Now, legally speaking, UUK could still turn around and welch on this deal. They could let the expert panel run, then ignore everything it says, and announce that they were putting us on the cat food retirement plan after all. But politically that would become a very difficult thing for them to do. The union membership would be incensed at this betrayal, and we would have a very sympathetic public and political system (not to mention regulator) behind us, angry that they agreed to tear up all the legal rules to allow the expert panel to run, only for its outputs to be ignored and overridden. Put yourself in the position of a 2019 VC. Is that something you would readily sign on to? The bigger risk for us is that we agree to a clear and transparent methodology, based on fair principles, and that this process ends up showing that the pension fund doesn’t have enough money in it, and the employers come to us in a stronger position to negotiate cuts to payments to balance the books. This is a possibility that many UCU analysts do not believe will come to pass, and let us hope that they are right. But even if they are not, at least we would be negotiating from a more honest place, with more of the cards out on the table. At least that would be a negotiation in which the truth got a fair shot, instead of us being easy marks to run over on the way to strengthening their books. Whatever happens, it will, as ever, be down to us to continue to be engaged, to continue to defend our interests, and to use the momentum that this strike has generated to build up the union to be even stronger for the next fight. Because the only real certainty is that there will eventually be a next fight. UCU Strikes: The Ballot, what it means and where we go from here. We came out on strike because in January the JNC (UUK plus chair) forced through a decision, based on the November 2017 valuation, to remove all Defined Benefits – totally unacceptable. UCU position – (1) refuse to accept these changes, (2) want to open up the issue of the valuation to joint discussion and (3) protect a fair pension. We reject March offer and make plans for continuing action. Employers make an offer in relation to the valuation process and HEC decide to put this to a ballot of members (people have a variety of complaints about the process – whatever the rights and wrongs of that, it isn’t relevant to the substance of the decision on the ballot). What we are about to vote on is to agree a process, not to agree an outcome. Understanding this distinction is absolutely crucial. We/UCU believe that the USS valuation is wrong and have argued for 5 years for a different valuation process. Avoiding being in the same position every time the USS scheme is revalued means addressing the issue of valuation. Some agreement over the valuation is a necessary, but not sufficient condition, of an outcome to the current dispute that is acceptable to us. We are now being offered a joint valuation process. 1st objective of UCU action has been achieved – the original (DC) offer is now off the table as implied in the UUK statement, confirmed in a direct answer to a question by Josephine Cumbo of the FT and then finally confirmed in the letter to Sally Hunt from Alastair Jarvis last Wednesday (day of Branch Reps meeting in London). So what are we being balloted about? The establishment of an independent panel to look at the valuation methodology and to have underpinning this panel a focus on DB and on ‘broadly comparable benefits’. We are being asked to say yes or no to what we asked for ie the 2nd objective of the UCU action. We are NOT, at this point, being balloted on a set of pension arrangements – this will come later. We would not, therefore, be ‘giving up’ the current industrial action – though it is likely that we would suspend it (see point 20 below). The pensions regulator is on board and the USS board now needs to agree this. Assuming that the USS board agrees, then we have won the first round of this battle – we’ve had the unacceptable offer/s removed and have forced acceptance of the need for a joint process to address the valuation question. Yet some people are unhappy – why? Because it came from the employers – not unusual in any negotiations process for one side to propose and the other to decide on the proposal (and remember, some members were equally unhappy about the March proposal for having come from UUK and UCU). Because they don’t trust the employer – if a lack of trust was necessary for negotiating and agreement making, few agreements would be made. We gain what we gain by strength in negotiation – and knowing when to deploy that strength. Because there are no specifics on what the final position will be – that’s because this isn’t a ballot on the substance of the pensions, but a process to generate information that will underpin future negotiations on the actual pensions outcome. 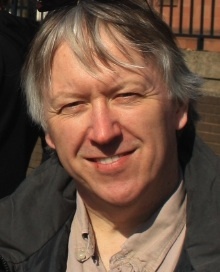 Because there has been no specification of timings – lots of speculation about how this expert panel process is only for the 2020 valuation – but correspondence between Matt Waddup/UCU and UCU Glasgow makes it is clear that the joint expert panel is aimed at the current valuation – ie will be available in time to influence what happens after April 2019. It is our understanding that UCU will convey this shortly. Some are arguing for a guarantee of no detriment at this stage. But at this stage, there is no ‘detriment’ on the table. If people are arguing that employers should commit now to no detriment in future, this is unrealistic – and even if UUK made such a commitment now, they could abandon that commitment when the Expert Panel on Valuation concludes. Whatever comes out of this valuation process becomes the next terrain on which to fight – or not. Because either we were right and the scheme is sound and doesn’t need to change. Or we were wrong and change in benefits or costs will be proposed. But even if we agreed increased costs were necessary, we could argue that they should be borne by the employers given they had a payment holiday some years ago – but we are not at that stage yet. In effect, some people seem to want to have the agreement completed before getting into the room with the other side! This is generally not how negotiations work. There are objections to mention of affordability and constraints of the existing regulatory regime – we can disagree in negotiations as to what is or is not affordable, but we cannot object to the concept of affordability in and of Similarly, we may not like the regulatory regime, and we may wish to pursue separate discussions with the regulator to establish what room for manoeuvre there is, but we cannot pretend that regulation does not exist or oppose it in principle. Some objections are because the UUK proposal doesn’t address a much wider range of issues, or because there is no focus on UUK governance – on the former, there are wider issues to focus on with our new members and activists, but this dispute is about pensions, and mission creep doesn’t help us with this; on the latter (and notwithstanding that the governance of UUK is a car crash that has got us into this dispute in the first place), it is not the job of any agreement with us to review/reform UUK governance – we would be up in arms if UUK suggested an agreement over the internal governance of UCU. UUK governance is for Principals/VCs to address – and they should. We defer to no-one in our willingness to fight for what is right in the workplace. But we cannot get anyone to articulate – in conversation or on Twitter – what else precisely, at this stage of the process, we are asking for. The question being posed is simple at this stage – is the specified form and operation of an Expert Panel, focussed on retaining a DB scheme and broadly comparable benefits, acceptable to us at this stage in our dispute? Discussions – on Twitter and elsewhere – about problems with the vagueness of the current ‘offer’ are misplaced because we do not have a current offer – we have a proposed mechanism to underpin an offer at the next stage of negotiations. People say this should go back to the negotiators – what for? We have what we wanted at this stage – removal of the January JNC imposed changes – effectively returning us to the status quo for the time being – and (potentially) an agreed process. In fact, UCU confirmed at the Branch Reps meeting that there will be a DB scheme for at least four years: till April 2019 as is, and for the following three years (till next valuation) whatever DB scheme comes out of the current dispute – a scheme which we, necessarily and by definition, will have agreed to. There are lots of risks in the process and in the future. The UCU choice of experts is incredibly important, as is ongoing communication and consultation with the membership. Being clear about what we will and won’t accept is crucial and needs to be understood by our negotiators. But at the end of any agreed process, based on whatever valuation comes out of it, proposals will be put to the Trustees and we will be balloted on whether to accept or reject them. To reiterate – because this point appears to have been lost from the debate, certainly on Twitter – at this point, we are not agreeing to accept whatever comes out of this valuation process. We are not being asked to accept a ‘deal’ that specifies what our pensions will look like. We are being offered the process we asked for. To reject the process we asked for risks making us look ridiculous, alienating some members, and losing student and public support. Members need to be very clear about the different stages of the process – negotiations will follow the valuation process. The upcoming ballot is only about the valuation process. A lack of clarity about what we are deciding in the upcoming ballot doesn’t help in informing members and makes us look divided and consequently weaker. Once the Expert Panel has concluded, we are back in negotiations about the content of any agreement. If at that stage we don’t like what we are offered, then we will take action to defend our pensions. If members vote yes in the ballot, and USS accepts it and the action is suspended, some people appear to feel that if activists ‘stand down’, they won’t stand up again. We have no reason to believe this (quite the reverse – we’re more likely to lose people if we try to keep them involved in action without clarity over why they are taking action). Not only are the employers unlikely to accept that industrial action continues throughout the valuation process (no employer would), but any strike action (or action short) would neither have a current objective (to get the employer to talk, because we’d be talking) or be timely for any ultimate objective – ie to influence an agreement, because we don’t have an offer of an agreement yet. If members vote no in the ballot, what are we saying? What comes next? We can, of course, continue our action, but without a new valuation the November valuation will stand. We cannot wish away external constraints in the form of the tPR timescales for the current valuation – and (whatever limited flexibility exists) these are not sensitive to our industrial action as they are not in the gift of UUK. To conclude, all disputes are resolved by a negotiated settlement. Our (UCU) position has always been that we want a joint process of valuation to underpin a negotiated settlement. If we accept the UUK proposal, we would be agreeing to take part in the valuation process that at some point would (or wouldn’t) lead to a negotiated settlement that we’d be balloted on. Engaging with the valuation process would be a necessary but not sufficient condition of a final agreement. We deployed industrial action to win round 1 – ie to stop the imposition of changes to DC and deliver the necessary condition (ie a fair valuation). That valuation process would then begin. When complete, we would negotiate on the basis of it (so long as the process had been robust), ballot on it and either accept it, or reject it – at which point industrial action would have an objective, which is to change the offer. We have a job to do while the expert panel is ongoing. We need to build our union and we need to stay united and keep the communications flowing. We need to build capacity and capability for what might come next. We need to talk about and act in relation to all of the other problematic issues that we’ve discussed on the picket lines over the last month. We have been successful to date, but there is a long way to go. There are tactical considerations to be made about how best and when is best to deploy our collective resources. What would be an absolute travesty is for us to be disunited after this ballot on process – for us, that really would feel like snatching defeat from the jaws of victory. 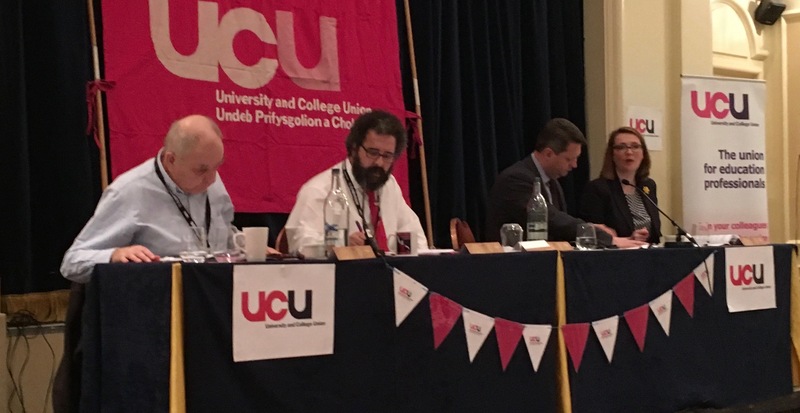 The Welsh UCU Congress once more showed the union to be at the heart of education matters in the Welsh post-16 sector when it met in Cardiff on 4th March. 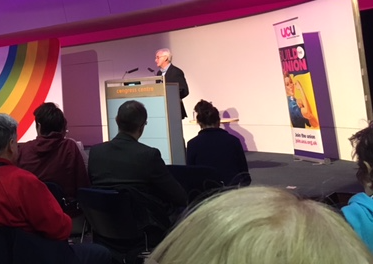 Opening the well attended conference – which impressively for me, offered bilingual translation from Welsh into English – Chris Jones, Vice-President Wales UCU, outlined many of the problems facing the sector – casualisation, zero-hour, contracts, and especially in HE, the gender pay gap. Chris also looked at the gains they had made in the last year. In Welsh FE, every lecturer was now on the national contract, and prospects looked positive for a joint funding council. Despite some problems, (which were dealt with later on), the Diamond report would offer the most generous grant or loan situation for students in the four nations. On Brexit, Chris pledged that no matter what position individual union members had taken in the referendum, all members were united against the insidious upsurge of racism, stating “for the UCU there was no ‘us and them’ only the one race – the human race”. She highlighted the government’s support for parity in esteem between academic and learning routes, and also talked of current moves to establish a single strategic authority to improve cohesion and promote collaboration as the foundation of a ‘whole systems’ approach which should give parity of esteem for part time and full time students in the system. Referring to developments in England she stated that it was important to ‘look at the unintended consequences that have too often emerged from reforms across the border.’ In a similar vein on TEF, she stated the Welsh government recognised and shared the UCU concerns about this, and while needing to live in the actual situation facing us, the government ‘did not share the same marketisation agenda as across the border’’ so would not be encouraging universities to take part in this. On the living wage issue, she talked of her concern that Cardiff was the only university that had achieved accredited ‘Living Wage’ employer status. Alun Davies AM, the minister for life long learning and the Welsh language struck a similar tone critical of the policies emanating from Westminster. Brexit had been an ‘unmitigated disaster’ and impinged on the conversations about ‘who we are’, and meant we needed to stand united against racist attacks, now becoming more common. Referring to FE he talked of the sector as often being on the ‘sharp end of change’ and also stated that there were often gaps between what was said in speeches on issues such as parity of esteem and the reality we actually experienced. This needed to be openly discussed. He commended and argued for the need to register all of the educational workforce, towards the aim of achieving equal status for all educational professionals in Wales. Some key questions were then put from the floor including one relating to the funding gap, a second on austerity. A question was then asked on democracy in universities, and a final one on the impact on Welsh speaking students of the Diamond proposals. A question was put requesting transparency on senior salaries in post-16 education, and on workload issues. In the subsequent discussion of the ministers’ contributions, points were made that while the Hazelkorn report was welcome, and dialogue was being requested, very little effort seemed to be being made to ensure that the unions’ voices were at the table. The Diamond report was also welcomed with its emphasis on lifelong learning, including adults. However the dangers of it increasing marketisation were also mentioned. On the living wage, while this was welcomed the issue of zero hours and fixed terms contracts also needed tackled. Secure contracts were felt to be key. While the EWC (Education Workplace Council) was welcomed it was felt important to move on to have proper representation on that body to deal with questions such as the charging of full fees for part timers, and the problematic nature of the disciplinary aspects of the code. The union was having to hire barristers to fight the vindictive use of it which was costing the unions thousands of pounds. Regarding CPD this was double edged unless the issues of adequate time to undertake it was tackled together with a say in the nature of CPD. No one wanted to use their precious time to learn how to fill in forms correctly. Finally on professionalisation, it was felt that proper workloads were key to developing a fully professional workforce. 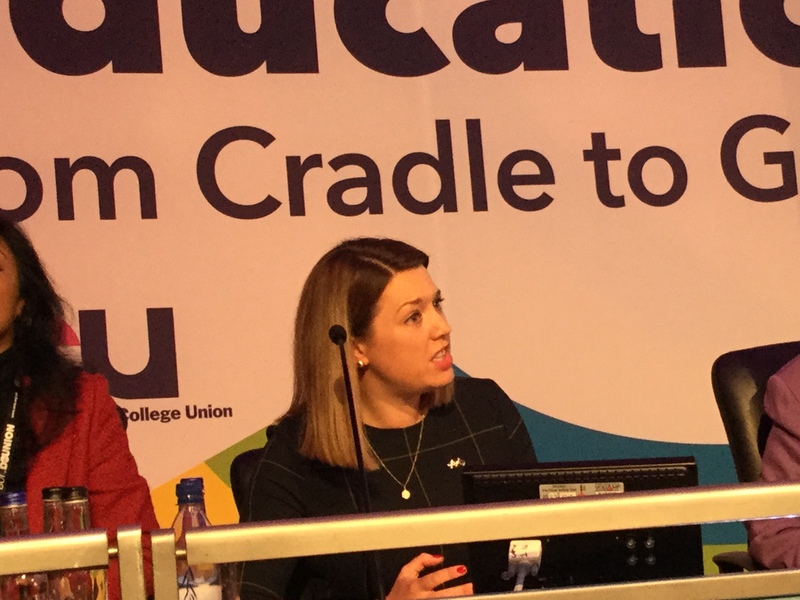 The HE Sector conference heard from invited guest Reneé Prendergast chair of UCU Northern Ireland who compared and contrasted some of the issues facing the sector in what was a period of political instability. Not surprising to those listening, the similarities in terms of heavy workloads, casualisation and the funding gap seemed familiar in both Wales and Northern Ireland. Representing UCU Scotland, I also addressed the HE Sector conference and confirmed that these issues were also common to us, although we were working in a situation where university governance was being democratised and where the current Holyrood SNP government had published a joint paper with the STUC, praising the work of workplace trade union reps – a clear contrast with either Wales or NI. The sector conference went on to debate motions on electing Vice Chancellors of Welsh HE institutions, on improving the current under representations of BME staff in academic roles, on the funding gap and its relationship to the sustainability of the sector, and on funding for reforms in Initial Teacher Education and Training. 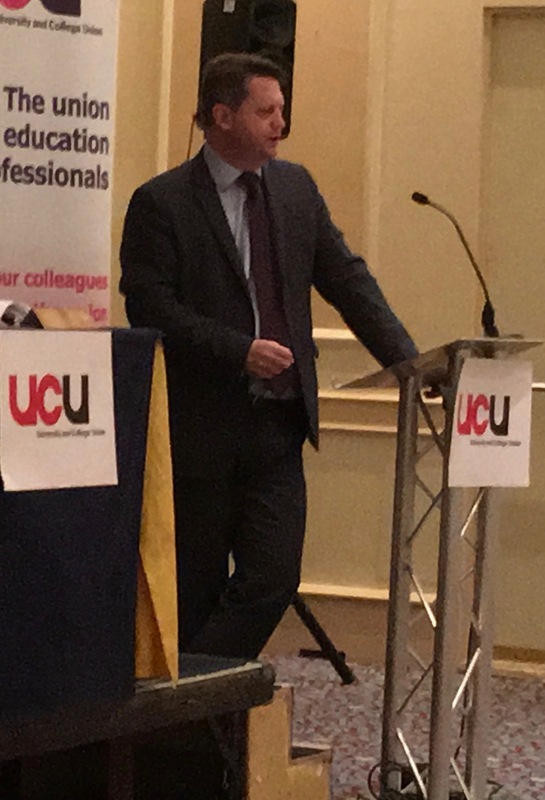 According to delegates I spoke to, the FE conference had a lively discussion on motions on growing workloads, lesson observations, the lack of union representation on the EWC, the pay claim, CPD and subsidiary companies in Wales. Unfortunately, transport being what it was, I had to leave before the full congress resumed after the sectoral conferences, but I want to thank my colleagues for a stimulating and positive experience, which left me with confidence for the union’s future in Wales. “The freedom struggles of black people that have shaped the very nature of this country’s history cannot be deleted with the sweep of a hand. We cannot be made to forget that black lives do matter”. For the UCU’s day of action on workplace racism on 8th February, branches are being asked to organise stalls, use UCU materials and show the UCU’s own Witness film. Recently some additionally useful materials on the whole issue of racism and fighting discrimination have appeared in the run up to , and since the inauguration of Trump. If you are showing the Witness film (which we recommend), we’d also suggest that many of the resources made available in the last month by veteran academic and activist Dr Angela Davis can also help kick off a discussion. We post them below for the possible additional use of members and branches. Although Black History Month is in October in the UK, it takes place in February in the USA, and it was fitting that activist, scholar Angela Davis helped launch it in Kansas State University, less than a month after her appearance with Black Lives Matter Co-Founder Alicia Garza in Conversation across Generations on You Tube, and her fantastic speech to the Women’s March in Washington last month (Click here for transcript) or here to watch it on YouTube. Similarly she rallied activists in Memphis, speaking at the to the Mid-South Peace and Justice Center’s 35th annual banquet, “Living the Legacy of Non-Violence,” on Jan. 14, 2017, two days before Martin Luther King Jr. Day. Again – a speech worth watching, to spark off discussion of the roots of racism, and racial discrimination, not only the the US, but worldwide. “Manchester Metropolitan University has informed all staff at MMU Cheshire of proposals for changes including the possibility of the permanent closure of the campus. At a meeting in June this year the University’s Board of Governors and the Vice Chancellor ruled out the option of ‘business as usual’. Managers have stressed their commitment to existing students enrolled on courses at Crewe, including to the quality of their experience of studying at MMU. There are just three options now under consideration: a reduced ‘focused’ presence on the existing site; a move to a Crewe town centre site, possibly in conjunction with new educational partners; and closure. All options have extremely serious implications not only for the future of the Higher Education offer in the vicinity, but for current academic and support staff jobs. The University has so far refused to rule out compulsory redundancies. UCU is opposed to compulsory redundancy and regional and branch officers have made this policy clear in every meeting with managers. The University Executive Group has commissioned a report by consultants Deloitte into the viability of a number of options and assessing the current operating position. As part of the compilation of that report, Deloitte and Senior University staff conducted a process of informal consultation with staff, student reps and some local political bodies and businesses, although this did not include consulting on the possibility of the continued operation of the Crewe Campus as it is currently configured. No members of staff at Crewe has so far been informed that they may be made redundant. The UCU branch at MMU is asking for you to sign our petition in support of the case for Crewe which we intend to present to the University’s Vice Chancellor and Governors in mid-November. If you have a direct connection with MMU Cheshire, please don’t forget to add this to your signature. Help our colleagues at Hull College! 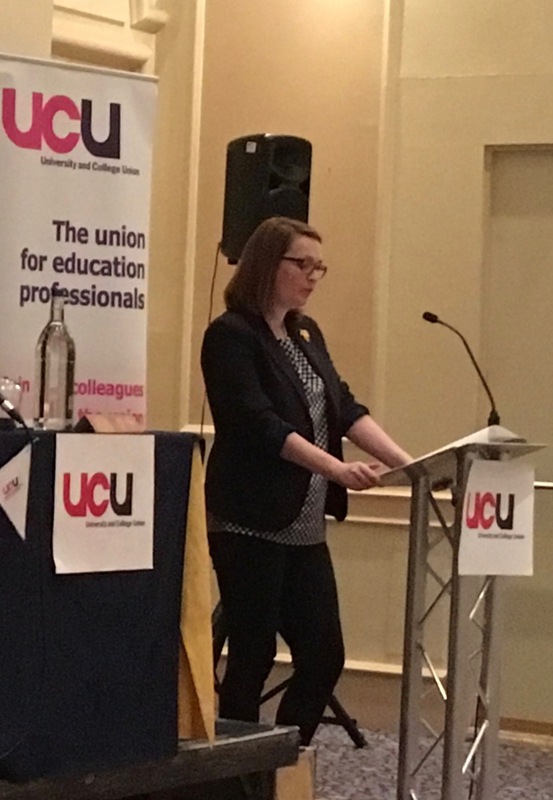 Jenny Prideaux who works at Sheffield College and is a member of the NEC, the Chair of the Recruitment, Organising and Campaigns Committee and FEC Vice-Chair, writes about a crucial campaign for the UCU in the FE sector. This is a call to all members to support Hull College UCU in its battle to save the college, save members’ jobs and defend the union. It’s time to stop Hull College bosses in their tracks! profit is being put first. what was once a great college is being run into the ground. It’s also an attack on the union itself. The branch officers who orchestrated last year’s successful pay and lesson observation dispute have been threatened with redundancy. This includes the branch secretary, the vice-chair and our president Rob Goodfellow. Our members at Hull, as you would expect from this branch, are determined to fight back. On March 18th, UCU’s National Executive Committee, passed a motion calling for the University and College Lecturer’s union to set up a summer school in the Calais refugee camp. This weekend (7th March) a fact finding delegation from UCU went over to the camp to look at how this can be implemented. We publish their report here, which was prepared by Dave Muritu from the NEC. Our trip to the camp in Calais with a UCU delegation was full of stark contrasts. Our aim was to spend a day in the camp with a view as to find out what UCU members could do to help these four or so thousand refugees realise their simple desire to live a normal and productive life in Britain. The day began with a tour of the Care 4 Calais warehouse, where we could not help but be impressed by the level of organisation and attention to detail that went in to the massive operation to sort and distribute, clothes, food, tents, building materials and more. This was in contrast with the sight we were confronted with as we entered the camp, several acres of wasteland that used to be people’s shelter and make shift homes before the authorities demolished the southern part of the camp. Our first destination was one of the two schools, which, along with a mosque and a church, were the only structures still standing in this part of the camp. We witnessed what you would see in any school or college; the teaching of English in small groups scattered around classrooms and a larger group being taught French. As more students gravitated towards the school it became apparent that ad hoc lessons were popping up all around the school, in and outside the classrooms. Our guide was asked, almost mid-sentence, if she was a teacher and could she help a young Eritrean man with his French. From what we saw, it was clear that there could never be too many teachers in camp. They would always find students who would hang on their every word. Later in the day, we were invited for tea by a group of Sudanese men in what was a shelter built from wood and tarpaulin. It felt important for them to have the opportunity to extent their hospitality, in some ways to tell some of their story but more so to enjoy the social normality that it represented. They had all been in Calais for a different length of time but they all shared the determination that they would not give up the nightly ritual of risking life and limb to try to ‘jump’ and make it to Britain to restart their lives. It was, however, noticeable that those who had been living in these incredibly difficult conditions for longest were showing signs of the emotional toll. What was also very clear was that the prospect of return to where they had come from was out of the question. There was nothing to return to. Having been to the camp, it has helped to harden my resolve to do everything we can to pressure our Government to get rid of this camp by allowing the refugees in to Britain. It is also clear that my trade union is full of members with loads of the skills that could really do so much good in the camp whilst it is still there. Our job now is to find the best way of making that happen. Taking a break from NEC business today, UCU members of the committee sent photo messages of support to colleagues threatened at both Hull College and at London Metropolitan University.